You’re still looking for that Valentine’s Day gift? And you still can’t think of a good one? Well I have some ideas…..I’m not going to say they are the best in SL because I can’t possible go to all the stores in SL to rank them. But I am pretty sure, they are nice gifts you might want to consider. The first one is a pair ring from ROZOREGALIA. One for yourself and the other for your partner, girl friend or boy friend. 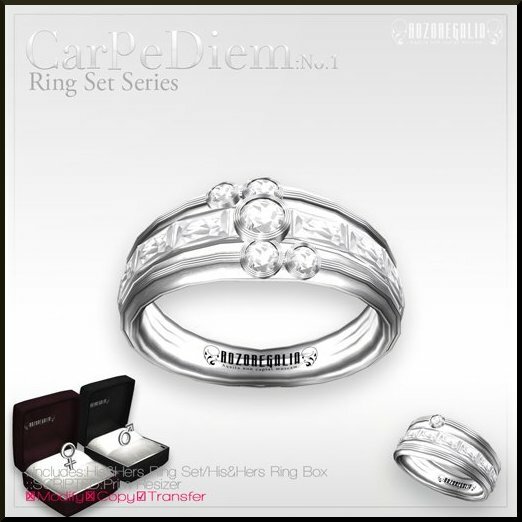 It comes with ring boxes for both rings and are all transferable (no copy). ROZOREGALIA is one of my favorite stores that has really high quality jewelry with amazing texture and exquisite production quality as you can see from the vendor poster below. I also made some more suggestions in the February 8th show of Fabulous Fashion TV (my accessories part starts from 24:35 in the video. Run, run! Valentine’s Day is this coming Sunday!! This entry was posted in Uncategorized and tagged ByKay, Gift, Kay Fairey, MC Designs, Rozoregalia, second life, sl fashion, Styles of edo, Valintine's Day, Virtual Impressions by Kay Fairey. Bookmark the permalink.